Tom - For the enlightenment of Essex boys like myself (and, fortuitously, for the alliterative payoff) would 'dickhead' be an adequate translation of 'peckerwood' in this context? I certainly hope so. 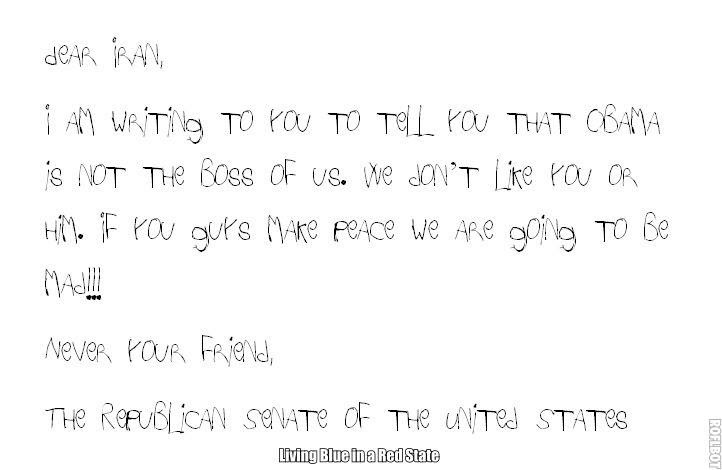 Did Sheldon Adelson write the letter the 47 Republican senators sent to Iranian leaders? Did Mickey Mouse recite the Constitution to the gathered Republicans in imitation Donald Duck voice? Did they confuse the Logan Act with Logan's Run? Can these children appreciate the patience with which the Iranians responded? Are they giving Americans and the whole world shock treatments of stupidity? Are they ready to pull up their pants? Can they get their foot out of their mouths and out of their butts? Can they hold their breaths until they burst? Can't we treat them like a viciously racist fraternity on the US Capital campus and expel them? Pull down their Greek letters? Can they all move into the Sands Hotel to live with Sheldon Adelson as punishment? Which foreign leader will they hand over Congress to next? Will they invite Marie Le Pen to a joint session of the national lunatic asylum to rail against immigration? Will they ever apologize to the insane for giving insanity a bad name? 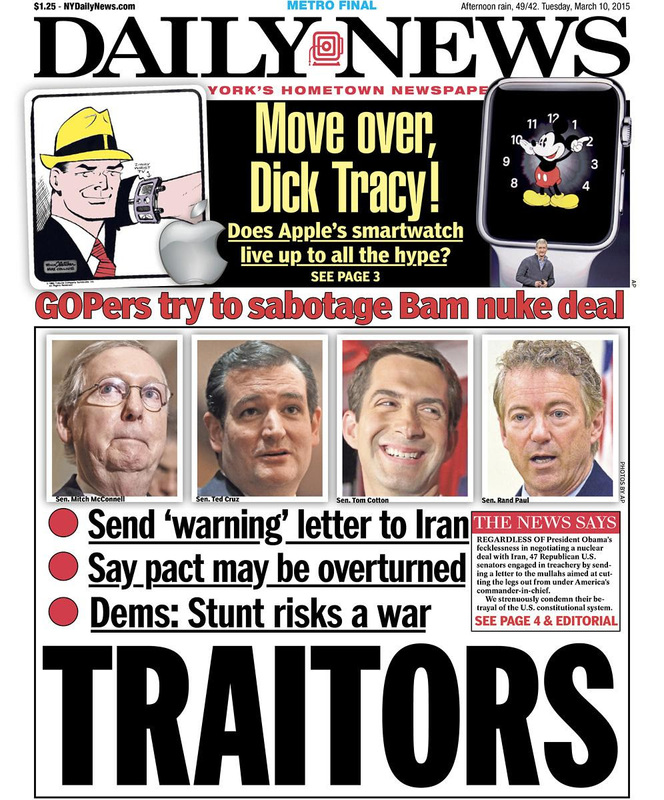 the 47 Republican senators sent to Iranian leaders? Republicans in imitation Donald Duck voice? Did they confuse the Logan Act with Logan's Run? with which the Iranians responded? Are they ready to pull up their pants? Can they hold their breaths until they burst? US Capital campus and expel them? Pull down their Greek letters? national lunatic asylum to rail against immigration? for giving insanity a bad name? 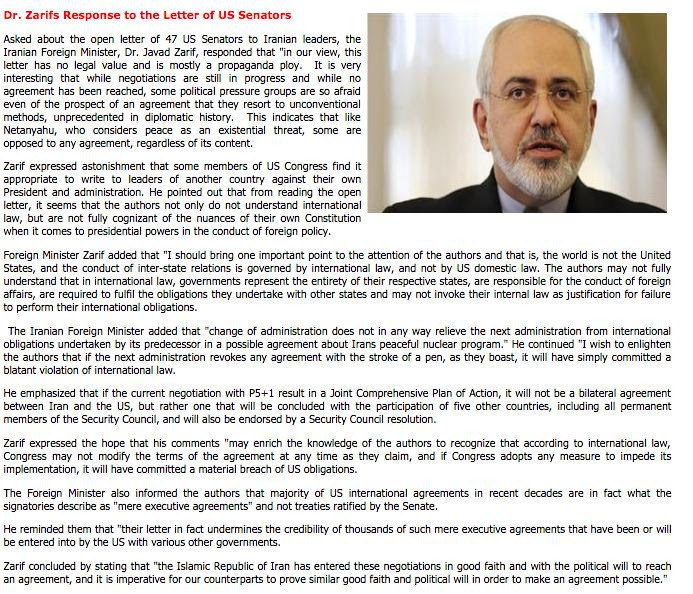 Dr Zarif's response is spot on. These poor daft boys - nobody's told them the USofA ain't the big hitter it used to be. Barry, that'll do well enough, though there is a more specific application of the term, in reference to a white supremacist prison gang and the culture thereunto. 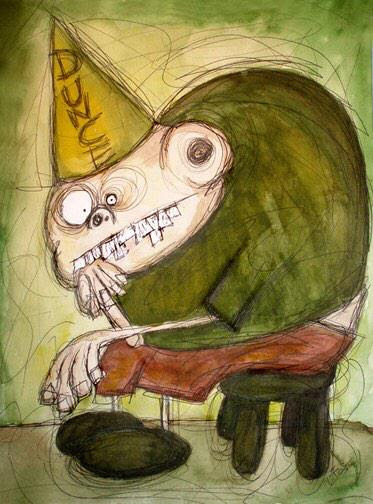 "Will they ever apologize to the insane for giving insanity a bad name?" 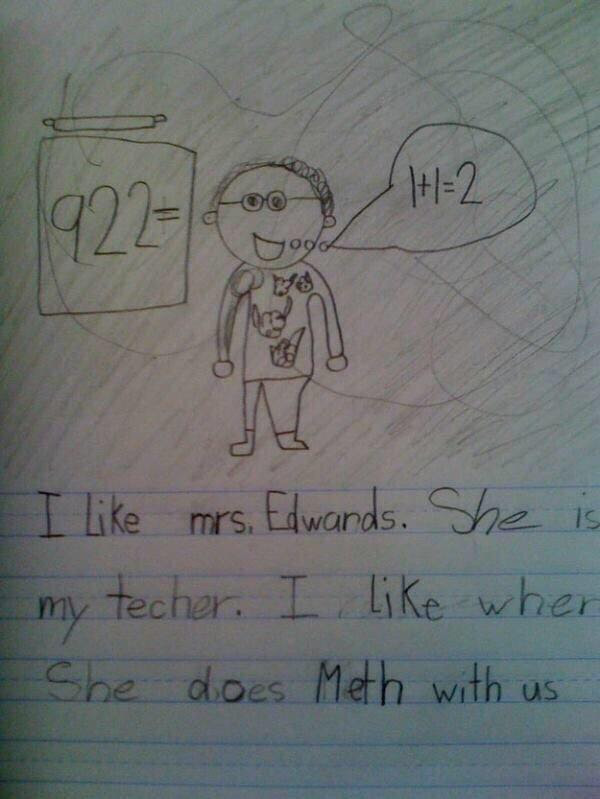 That's so funny that it's almost not funny. The boy who supposedly wrote the Iran letter (or anyway was happy to have his name affixed) is perhaps not so daft in that it's hard to imagine how a fortune of millions (in the so called campaign treasure chest, accumulated from the likes of Kristol, Singer, the K-Bros et al) could have been gained through other means, by such a nonentity. For the most venal, war has always been a moneymaker. Oh, and that tired fantasy of the Iranian nuclear weapon. You'd think the Israelis would be bored with jacking off to that one, by now! aesthetic enough to be interesting to those unconcerned about it in the first place. It's not a game Charlie, it's reality. Even if he's just a tool of others, that kid you dropped the 750 on has a great future in stirring up real wars in which other people will get killed. I see a career for him in that. Smart money this time, better shot over the long course than your previous bets. It was not meant to be aesthetic in the slightest degree, doc. Anybody who isn't concerned "in the first place" about America being sold out to Israel must be a traitor or a supporter of the TP -- which nation will it be?